﻿SHOPAROO... Scan store receipts to get free money for our school. Over $300 earned so far! ​ Donate to theAuburn St. Vincent de Paul food bank and help HFS. Buy Grocery Outlet SCRIP to donate to the food bank and HFS earns 12%. Order via the special section on the SCRIP ORDER FORM, and we'll deliver the cards for you. $900 has been donated since this program began in 2016. SCRIP is a popular fundraiser because families do not have to sell anything or buy anything extra. The school earns money from your regular, everyday shopping. 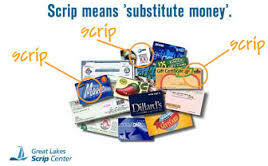 SCRIP just means "substitute money." When you purchase SCRIP, you are purchasing gift cards and certificates that work just like cash. You can use SCRIP to purchase every day expenses like food, clothing, gas, and other essentials, and with every purchase, you earn revenue for Holy Family School. Holy Family purchases the cards and certificates at a discount and sells them at face value. The discount can be as high as 50%! and get your cards even faster! ask questions anytime the Scrip Store is open. Click link above to download the order form. Completed orders can be turned in to the school office any time during the school year. ​Your order will be processed as soon as possible, typically the next school day. but many are available the same day.